I was so excited when I found I had won a hard copy of Strange The Dreamer by Laini Taylor. I love the gorgeous cover. How about you? I was awed and amazed with the excellent world building and the romance that crosses all barriers. The characters are richly developed and complex, each one vital to the story in their own way. 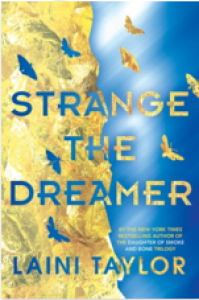 I loved everything about this unputdownable fantasy, so I will warn you to start Strange The Dreamer on the weekend, lock all the doors, pull the curtains, and put up the DO NOT DISTURB sign. My only complaint…There is another book and you will need to read it to get all the answers. I was super excited that I won a copy of Strange The Dreamer by Laini Taylor. What exactly did the Godslayer slay that went by the name of god? And what is the mysterious problem he now seeks help in solving? laini. How did he dream her before he knew she existed? And if all the gods are dead, why does she seem so real?